I live down a long gravel road and have never been able to go walking with my little one. No stroller I have tried would roll on the ro cks and dirt to where it would make our walk enjoyable. 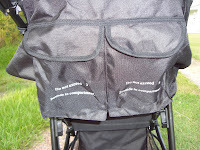 That was until I tried the GoGo Babyz Urban Advantage Stroller. I was thrilled to have the chance to review the Urban Advantage Stroller.What made it easy to push on uneven rough ground is its 3 wheel 12-inch rubber airless tires that never go flat ! I am now able to take Bryce on an afternoon walk that we both can enjoy with no problem. The first thing I noticed when we tried the stroller out for the first time is how comfortable Bryce seemed to be ! He sat back to enjoy the ride ! 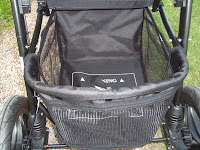 The seat is well-cushioned (removable, machine washable seat cushion) and has four-position reclining. 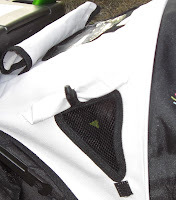 It has a five-point, padded safety harness to keep them buckled in and safe. I think one of my favorite features is the unique brake-activated kickstand that provides added stability and safety to help prevent tipping accidents when parked. It also has a wrist strap to prevent run away strollers ! Living in the south this time of year we have to worry about heat and sun exposure. The GoGo Babyz Urban Advantage Stroller has an extra large multi-position sun canopy with a large rear window and two side vents with covers on the canopy, which is great for hot and stuffy days. Handle height 41", Weight 27 lbs. 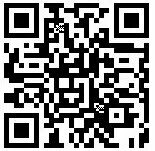 Go-Go B abyz® is a family oriented company that strives to make innovative, safe, and quality products that make life easier when you and your baby are on the go. Our mission is to design products that provide innovative solutions that resolve the everyday difficulties faced by busy parents on the go, and by doing so, minimizing the time and frustration related to being on the go with children and making that time easier and more enjoyable. The GoGo Babyz Urban Advantage Stroller is available in a rainbow of colors, I am sure you will find one that fits your style ! BUY: Visit GoGo Babyz online to purchase HERE. A GoGo Babyz Urban Advantage Stroller, your choice of color ! August 12, 2009 11:24 AM . Winner has been emailed. you have 48 hours to reply. Ahhhhhh I love this stroller Susan!!! The GoGo Babyz Urban Advantage Stroller seems like the Cadillac of Strollers!! I never thought I would say this but I am DROOLING over this Stroller!! And what a FANTASTIC Review!! YOU left NO DETAIL out!! Gramma's can do that, right!!!??? Eek! What a great stroller! I have to tell my BFF. 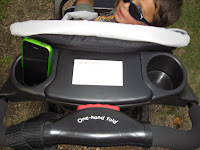 Oh I am LOVIN' the gogo Kidz Travelmate,The gogo Kidz Travelmate is a convenient and safe attachment for a variety of convertible/toddler car seats. Instead of carrying your car seat and child through an airport, they can now be wheeled through a crowd! What a NIFTY idea!!! I am so Thrilled to have the Chance to win the GoGo Babyz Urban Advantage Stroller!! Many thanks!! Your Button holds a place of HONOR on my Sidebar! Life in a House of Blue is Always on my Blogroll! YOU BET I follow you! Whenever you are not in control of the product, make sure to use the brake/ securing system provided. They also have the Infant Cruizer AT which looks awesome!! They carry the gogo Kidz Travelmate! Very cool for traveling with the carseat! I follow on you on Twitter and I tweeted! I commented on the awesome chore card game. I will have to keep that in mind for when mine get older! Another product they have is the Infant Cruizer AT , which looks awesome as well. Great giveaway! I also like their Recycled Urban Advantage. That's great that they fix them up and put them back in production. Go-Go Babyz develops unique solutions for strollers and car seats that make life easier and children safer during travel. 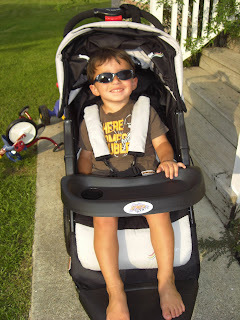 I think the recycled urban advantage stroller is also pretty fantastic! Gogo Baby was founded in 2003, the father and daughter design team focus on safety and convenience for child transportation products. that infant cruizer looks so cool! I think it would be great to have the Infant Cruizer AT for when I travel!!! I am a follower of course!!! They offer a Recycled Urban Advantage stroller which I think is so awesome. CoolCruelMom is following Life in a House of Blue on Twitter and tweeted about the giveaway, was thrilled to add to my blogroll at http://coolcruelmom.wordpress.com and am following you on Facebook! July 23, 2009 at 11:31 PM This comment has been removed by the author. It ships within 24 hours! This is a wonderful stroller! The Infant Cruiser looks cute! i love that they are family oriented, and focus on safety and convenience. I learned that their Infant Cruizer's have a fold up design and telescoping handle that save a TON of space over full size strollers. They also have an Infant Cruizer which is very cool! I also commented on your Soy Crayon Rocks post. Those would be great in a preschool classroom! I commented on the SweetPea3 MP3 player which my daughter will be a proud owner of for her 1st birthday! Go-Go Babyz is a family oriented company with a father and daughter design team. I would like to have the gogo Kidz Travelmate and the Car Seat Protector Bag. They have a travel mate to cart around the car seat when traveling. I learned that in addition to being members of JPMA, they are certified by the JPMA Stroller Certification Program, and all Go-Go Babyz products are personally mom, dad and grandparent-tested. Sounds good to me! I really like that they are focused on family. Thanks for the chance. How cool, might have to order me one! Nice stroller. Another item they have that I reallt like is the Infant Cruizer AT. LeslieVeg left a Friday Afternoon Tweet! I adore the GoGo Babyz Urban Advantage Stroller!!!!! Another product that I like is the gogo Kidz Travelmate. They received the prestigious 2008 Top Choice Award from Creative Child Magazine. The company was developed in 2003 by a father & daughter design team. The infant cruiser AT looks AMAZING!